Public tours to the Oireachtas currently aren’t allowed to enter the chambers – but a Labour TD has said that this should change. THE DÁIL AND Seanad chambers should be opened to the public on visits, a Labour TD has said. Dublin North Central TD Aodhán Ó Riordáin said that allowing members of the public to visit the chambers of both houses of the Oireachtas would “bring people closer to the democratic process”. 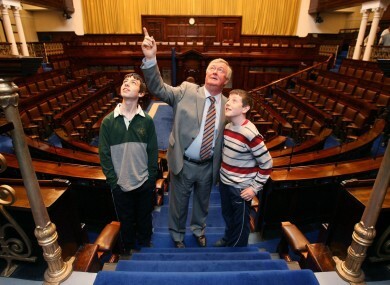 Members of the public were able to enter the chambers on two Oireachtas Family Days held in June 2008 and 2009. However the open days have not been held since and so visits have been restricted to general tours of Leinster House. Ó Riordáin said that the visits could take place when the Houses are in recess if it’s not possible to do it on days when they don’t sit. A spokesperson for the Oireachtas said that the current tour of Leinster House allows visitors to look at the Dáil and Seanad chambers from the public gallery. “There are no plans at the moment to include the floors of both Houses on the tour itinerary”, the spokesperson said. Visitors to Westminster in London are allowed to enter both the chamber of the House of Parliament and the House of Lords as part of the general tour. Email “Open the Dáil and Seanad chambers to the public, says TD”. Feedback on “Open the Dáil and Seanad chambers to the public, says TD”.